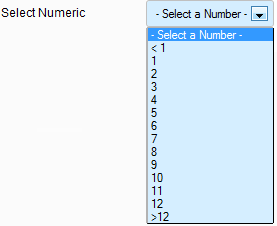 A field "select numeric" (or numeric drop-down list) automatically creates a numbers list (or numbers menu) with a single choice. 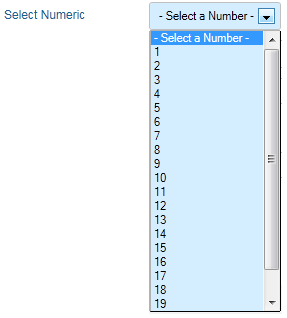 Each choice in the list is an option. 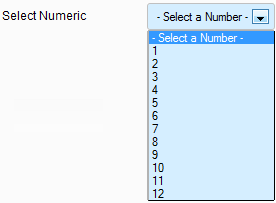 A field "select numeric" contains at least one option. Required, write the starting value. Required, write a value of step (or increment). The step is a positive or negative value. Required, write a maximum value not to exceed. If the parameters Start=1, Step=1 and End=12, you obtain the following result. 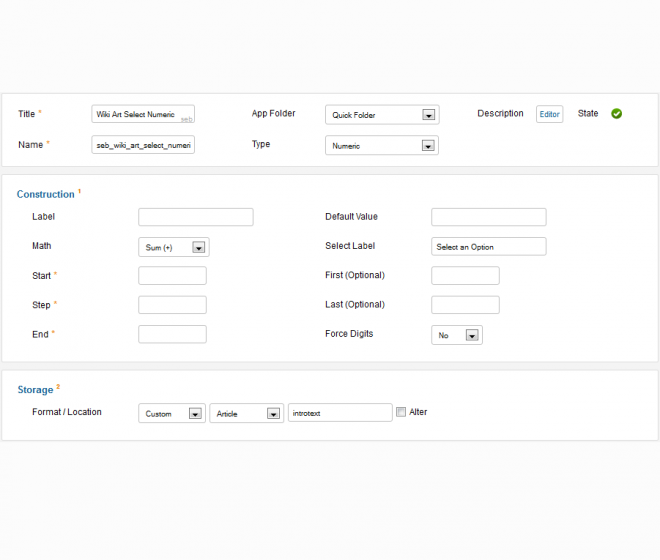 Optional, write a value to be placed at the beginning of the list. Useful if the value is outside of the generated list, a particular case. Optional, write a value to be placed at the end of the list. Useful if the value is outside of the generated list, a particular case. use the last two parameters (First(Optional) and Last (Optional)) for the lower and upper bounds of your numerical sequence. 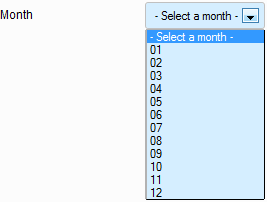 In the following example, we use bounds "< 1" and "> 12"
Select option 2 (2 digits) for the "Force Digits" parameter if you use "select numeric" field to select a month of year.